The Crossings Church Opens Big with Pylon Sign Facing and Exterior Building Sign! 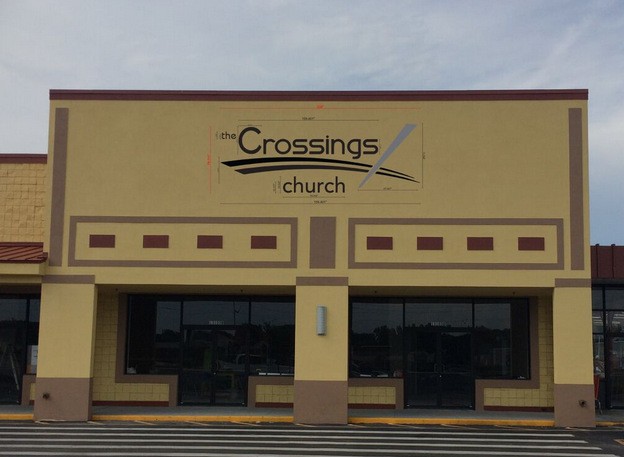 The Crossings Church Opens Big with Pylon Sign Facing and an Exterior Building Sign! Are you moving your business or organization to a new location? Have you let your loyal customers and patrons know yet? Do the people in your new neighborhood know you are coming? Well, what are you waiting for? It is never too early to let consumers know that you are pulling up your stakes in order to move to larger dwellings. 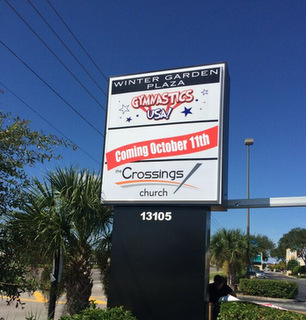 The Crossings realized this, so they contacted Citrus Sign Studio for church signage in Winter Garden, Florida. Their choices? Pylon sign facing and exterior building sign! 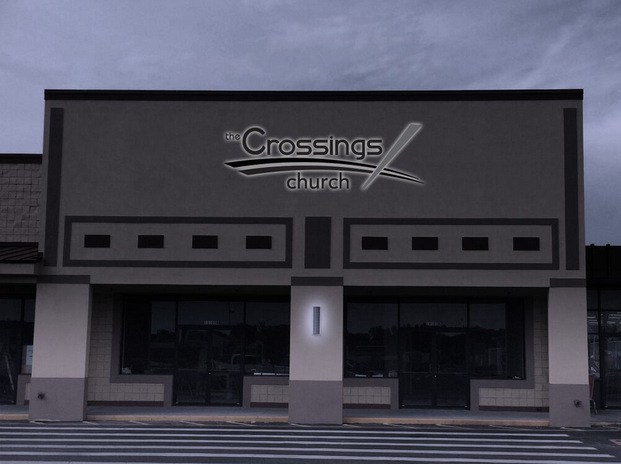 Located on West Colonial Drive in Winter Garden, The Crossings is a community church whose mission is to connect the reality of God to the reality of life. They do this through ministries for adults, college-aged students, and children through sharing meals, topical studies, and fun events. They also believe in creating a community of Christ followers who live simply, serve joyfully, give generously, and worship authentically. 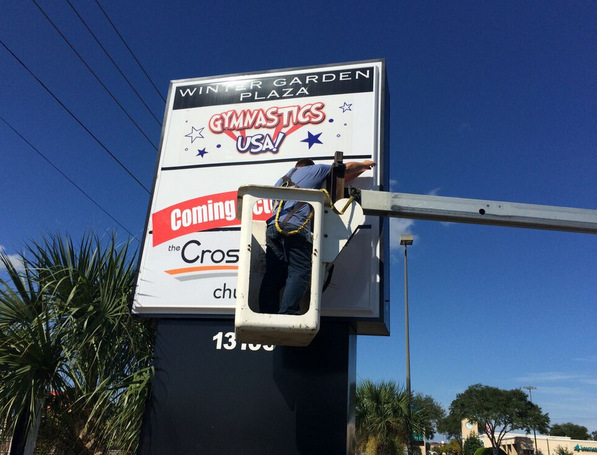 When an organization that provides such positive benefits to the community came to us for exterior signs for church in Winter Garden, FL, we were more than willing to help. They were moving into a new facility and needed a variety of markers to get them off the ground. Fortunately, they contacted the right sign company! Printing the pylon sign face! The Crossings was smart and got ahead of the ball with their signage. As they were working on their brand new 20,000 square foot facility, they contacted us for exterior building signage and graphics for their pylon sign. 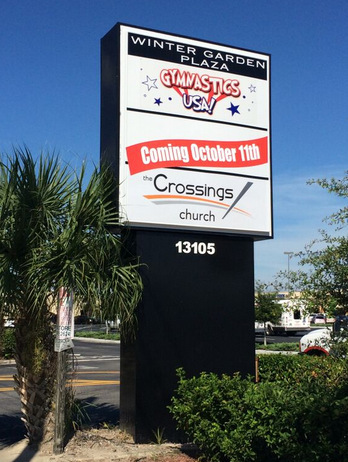 The Crossings was well-aware that they were going to hold their first service on Sunday, October 11th. They wanted to make that fact public as soon as possible. To help with this, we incorporated a “Coming October 11th” add-on to their pylon sign facing. After October 11th, we can simply remove the additional graphic. 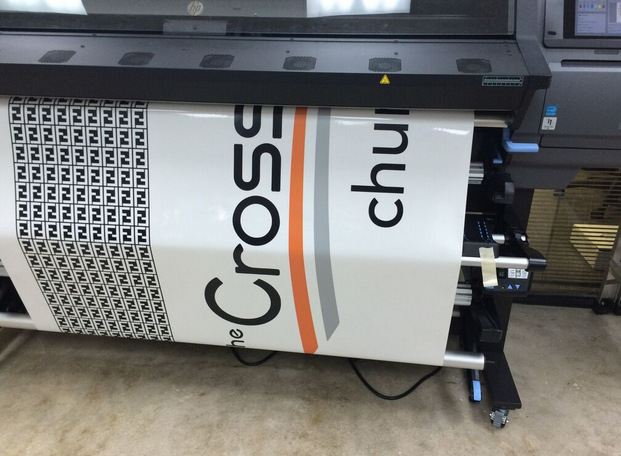 All of the graphics were printed on top quality cast vinyl using our cutting-edge large format digital printer. Getting ready for channel letter installation! What a great new look, even at night! After receiving final approval on the exterior sign permit, we took on the exterior building sign fabrication and installation. The sign is made out of custom channel letters that match The Crossings’ unique branding. The letters are made entirely of aluminum with the back open, so LED lights can shine out creating a halo effect against the building around the letters at night. They are a must-see so do check them out! Are you moving soon? Don’t forget your signage! Don’t know what you need? No problem! When you contact the friendly professionals at Citrus Sign Studio, we will listen closely to your goals and perform a site survey before making recommendations that fit your budget. Once you are happy with our proofs, we fabricate and install your new markers to meet your timeline. Want to find out what we can do for you? Call us for a free consultation today!